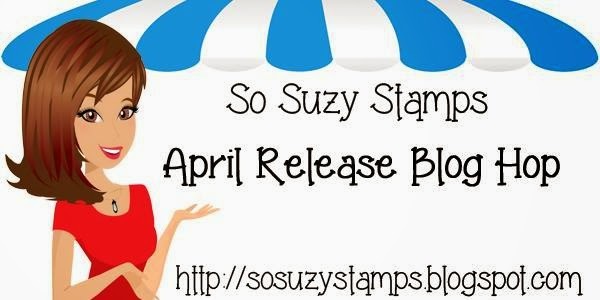 Hey everyone, welcome to my stop on the So Suzy Stamp's April Release hop! Are you loving all the fun birthday designs so far? You should have arrived from Steph's pretty blog. Remember, if you comment on every single blog post you'll be entered to win a $15 gift certificate to the store - no foolin'! I actually wound up stumped for a bit on what to make for the hop...guess who doesn't have any So Suzy birthday stamps?? 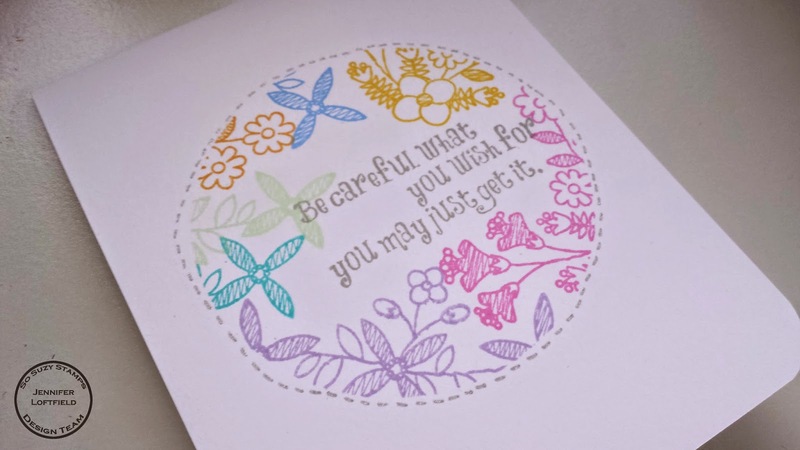 Silly, I know, but then I came across the Careful What you Wish For in my collection and went "ooooo"...LOL After all, who doesn't want their wishes (especially birthday wishes) to come true? 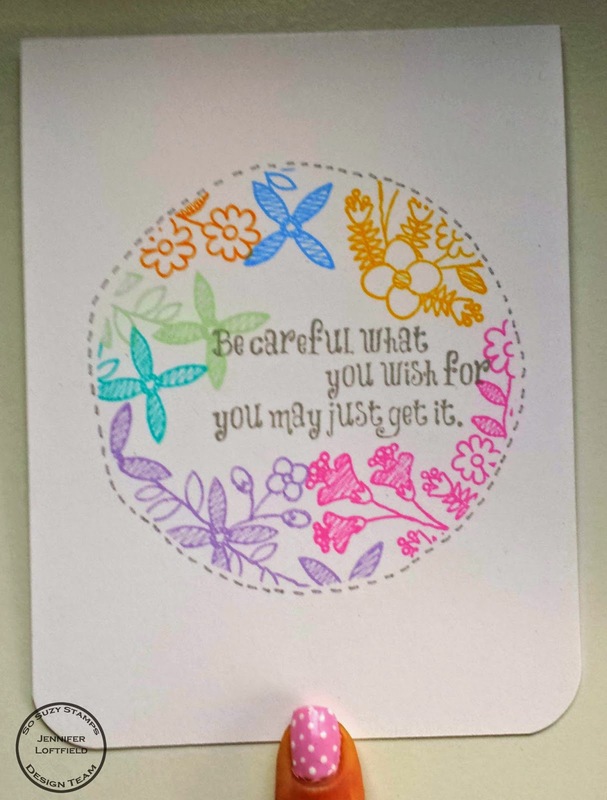 I decided to mimic a pretty card I saw on Kristina Werner's blog and made myself a circle mask to fill with flowers. I inked up the new Flower Doodle Corner and Flower Doodle Trio with a variety of springtime ink colors and went to town! The outside edge was lacking definition I thought, so I grabbed a silver gel pen and drew in some faux stitching. Note to self; trace a circle to follow next time. A quick rounding of the bottom corners and this card was done. Remember to leave comments on all the fun blog posts to be entered to win the gift certificate! Winner will be announced April 6th on the So Suzy Stamps blog. All right, now you're off to my buddy Sharon's pretty blog. Happy hoppin'! Please note - some links are affiliate links, meaning I get credit if you shop using one of them. Seeing as they finance giveaways and prizes, I would greatly appreciate it if you used them. Thanks! Love how you used these stamps. Innovative and pretty! Your showcase of the flower doodles is fun, especially with the 'doodly' circle! Definitely a smile-making, day-brightening card! Ok, love your nails lately! The Polka Dots are my FAV! As for your card....CUTENESS!!! 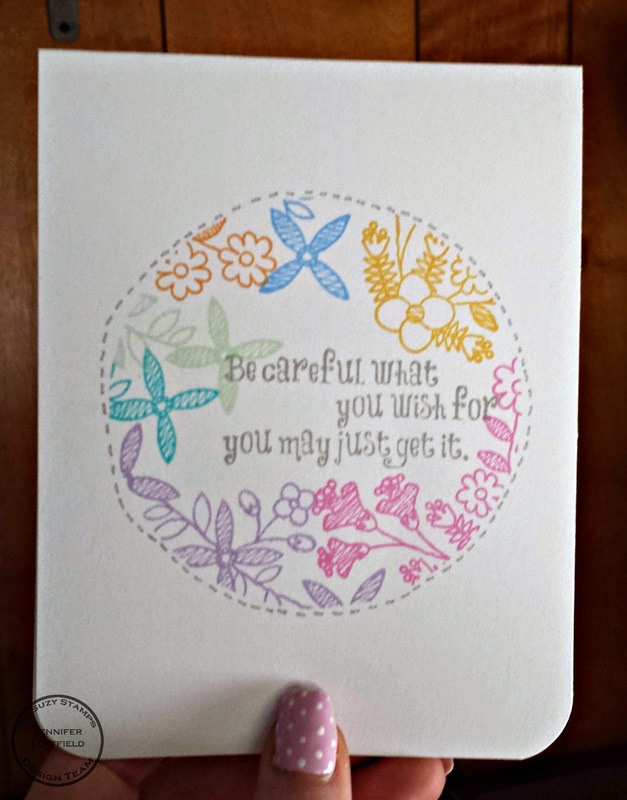 The colors are so happy and perky, the sentiment is perfect, and the faux stitching is so YOU! (Warped and all! LMAO) HUGS! Love that you combined the 2 stamps. Love the colors my friend! I second the "love you nails" sentiment. As for the card, I love the simple style and your use of color. I am a big fan of clean and simple and single layer cards. I also love that I have already ordered both those stamps. Lovely colours in the card. You made an elegant job. The card is so pretty. the soft pastel colors are so great for spring. Love the wreath effect. So adorable! Great springy colors and love the CAS look!